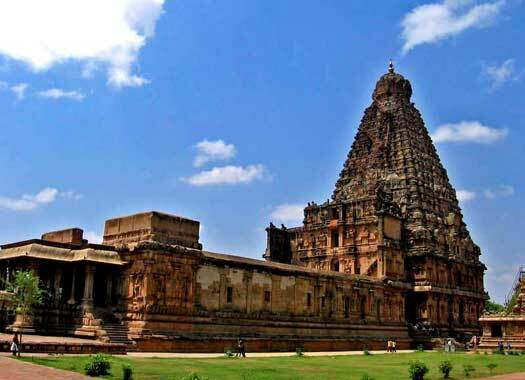 Thanjavur was a minor Maratha kingdom which was founded by Vyankoji, the younger brother of the first Maratha emperor, Shivaji Maharaj (although some sources claim him as the son of the emperor). He began the Thanjavur, or Tanjore, dynasty which ruled the state until 1855. The city itself is one of India's oldest, with a history which reaches back into the Sangam period. During the rule of the later Cholas, it served as their capital, subsequently being ruled by the Pandyas, the Vijaynagar empire, the Madurai Nayaks, and the Thanjavur Nayaks, before the arrival of the Marathas. The city is now in Tamil Nadu state in south-eastern India. Brother of Maratha emperor, Shivaji Maharaj. First maharaja. Son, aged 12. Abdicated in later life. A three year period of anarchy follows Tukoji's death. His only legitimate son, Ekoji, succeeds him but barely holds onto his position for a year before dying of (probable) natural causes. A minister who gained power behind the throne. Widow. Ruled under Sayyid's control for a year. Deposed. Sujanbai defies Sayyid's control and drives out the pretender, Katturaja. He seeks help from the French, re-invades Thanjur and deposes the queen. Backed by his claim to be an illegitimate son of Sarabhoji I, Katturaja gains the throne under the name of Shahuji II. His rule lasts for just a year before disagreements with his French former allies and intriguing behind the throne force him to abdicate voluntarily in favour of Pratap Singh. Former pretender who seized the throne. Son of Tukoji. Ended the period of anarchy. An attempt by the British East India Company to restore a maharaja of Nayak lineage to the territory is blocked by the Maratha line under Pratap Singh. Following the outbreak of war between Tipu Sultan of Mysore and the British East India Company in 1780, Tipu's forces attack and plunder Thanjur, leaving it impoverished. Adopted son of Tusalji. Ascended aged 10. Brother of Tusalji and regent. Seized throne in 1793. The district around Thanjur is ceded by Sarabhoji to the British East India Company, with the maharaja retaining direct control over the capital itself and just a small tract of territory outside it. Shivaji has no heir, only an adopted son and two daughters, and the state is absorbed into British India under the controversial annexation policy known as the Doctrine of Lapse (abandoned in 1858). Following this it is administered under the Viceroys of India. The maharajahs retain an Hereditary title without being able to exercise any power. Thanjur was annexed by the British in India in 1855, after the last maharaja died without a son to succeed him, the customary practise of adopting a successor not being recognised at the time by Britain. The late maharaja's surviving daughter claimed the title, and was allowed princely privileges but not political power. Records are unclear but it seems that after her, the grandson of Shivaji (II) by his adopted son became the titular prince, and the title has proceeded through his direct descendants. Daughter of Shivaji. First to claim the hereditary title aged 10. Vijaya, otherwise known in later years as the Great Lady, marries Sakharam Saheb, prince of Kolhapur. Son of Shivaji (II)'s adopted son, Serfoji. Son of Shahaji Raje, son of Shivaji (III). Thanjavur is submerged within the republic of India. Son of Shivaji (IV). Born 1969. Has two daughters.